If you are looking to purchase some cool dog products that will make your favorite furry companion feel and look great, there are a plethora of awesome dog shirts that you can choose from. To make it easier for you to decide, we have selected some high-quality options for you to consider. Our list is quite diverse, and we believe that you won’t have any trouble in finding one that suits your preferences and the style of your dog. With nine distinct colors and designs to choose from and a wide variety of sizes that can fit any dog, the Blueberry option will satisfy even the pickiest customers. The shirt is made from 62% polyester, 33% cotton, and 5% Spandex, meaning that it is very durable, comfortable, and adjustable. No matter which color you choose, each shirt is designed to make your pet look fresh and elegant. 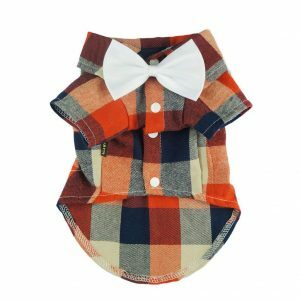 The bright and vivid colors will make your pooch stand out from the crowd, and customers were happy with the quality of this option and the fact that it is machine-washable. 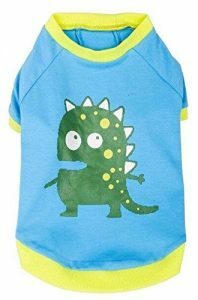 The Blue Dinosaur model is an excellent option for owners that are looking for a playful shirt that will complement the looks of their cute little pooch perfectly. The hippy and smart look will make everyone turn their backs to take a quick look at your beautiful furry companion. Similarly to our previous product, this option too is built to offer exceptional durability for even the most active dogs, comfort, and adjustability. The use of 5% Spandex will ensure that even if your pet gains a few extra ounces, the shirt will still conform to her body comfortably. Does your dog love to watch the NFL during the weekends with you? If the answer is yes, then why not get a shirt for him or her with the team you both love? You can even get one that matches your own T-Shirt since you have over 30 different designs to choose from, meaning that finding the perfect one won’t even be a problem. The shirts are made from a durable poly-cotton fabric that is designed to keep the garment wrinkle-free so that even the most energetic puppies can wear it. All the designs are officially licensed meaning that you get the guarantee of a quality product. This versatile option is suitable for most breeds such as Chihuahua, poodle, bulldog, Yorkie, and more. As a plus, you can also purchase it for your cat, provided you choose the right size. 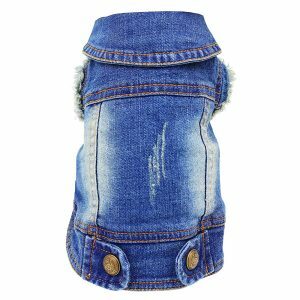 The jacket is suitable to be worn in all four seasons, and the comfortable fabrics will ensure your dog can wear it even when sleeping in his or her favorite dog house. The SILD model is not only fashionable but also very useful if you are looking to protect and care for your pet since the fabric is both comfortable and durable. You can also choose between four different designs, depending on your taste. The Fitwarm Floral is the perfect purchase for owners that want to prepare their pooch for the summer. The floral design and the bright colors will ensure that your pet will always be the star wherever he or she goes. The unit is available in a wide range of sizes so that you won’t have to look too hard for the right fit. The materials used are very lightweight and comfortable, meaning that your pet won’t get too hot. The shirt is also very easy to clean, a feature that many customers have praised. 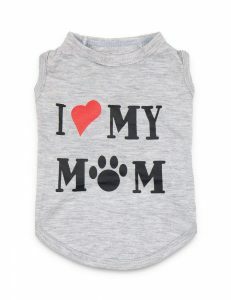 The DroolingDog shirt comes with a very cute “I love my mom” print on the back that owners adore. It is made from a very comfortable and lightweight material and is great for exercising, playing, and pretty much any other outdoor activity. This versatile option can also be purchased for your cat, as long as you get the right size. This cute casual shirt is perfect for a wide variety of occasions such as wedding parties, formal events, or just everyday wear. 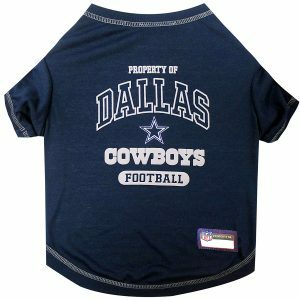 The apparel is made using a very soft and comfortable fabric, meaning that your pooch won’t feel constrained when wearing this shirt, nor will he or she get overheated. The option is available in many sizes, and it matches perfectly with a detachable wedding bow. Customers were very satisfied with this option, praising the cute design and the accuracy of the measurement guide that allowed them to get the perfect fit for their pooch. 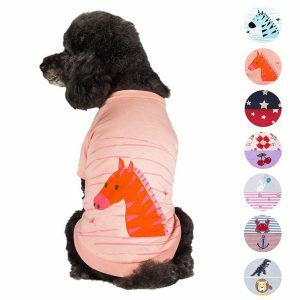 This cute black shirt is designed for small and medium breeds such as Shih Tzu, Yorkie, Chihuahua, poodle, pug, terrier, and other mini teacup breeds. It is made from a quality cotton blend, to ensure a comfortable and breathable experience. You also get a charming message with a paw print on the back of the shirt. Cleaning this option is also quite straightforward, and you won’t have to waste precious minutes washing it manually since this option is machine-washable for easy care. Do keep in mind that the shirt tends to run a size small, so for the best fit it is recommended that you go one size up. If you just started looking in the quest for the best dog shirts, you may have a surprise. You probably realized by now that the best shirts for dogs are not easy to come across. 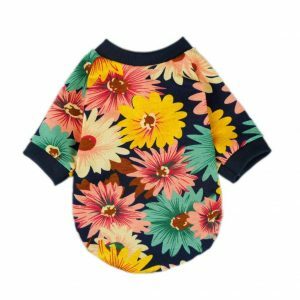 However, there are certain general rules that need to be followed when looking at dog shirts reviews, such as the material the shirt is made of, its design and its dimension. Out of all the models that you may find for sale, you should be looking for a material that your dog will feel comfortable in, which – unfortunately – is not a one-size-fits-all type of solution. Depending on the breed, dog products tend to differ, as the animals’ needs are also different. Before making a final dog sweater comparison, you should first make sure that your pet’s fur is suited for a type of fabric, such as wool or cotton. Generally, dogs with longer and thicker fur yarns are more resistant to the cold season, from the low temperatures to the merciless wind, which means they don’t need very thick pieces of clothing. On the opposite pole, dogs with very short hair may need an extra layer of fabric to ensure their full protection. Depending on the season, the choices you make might also vary. 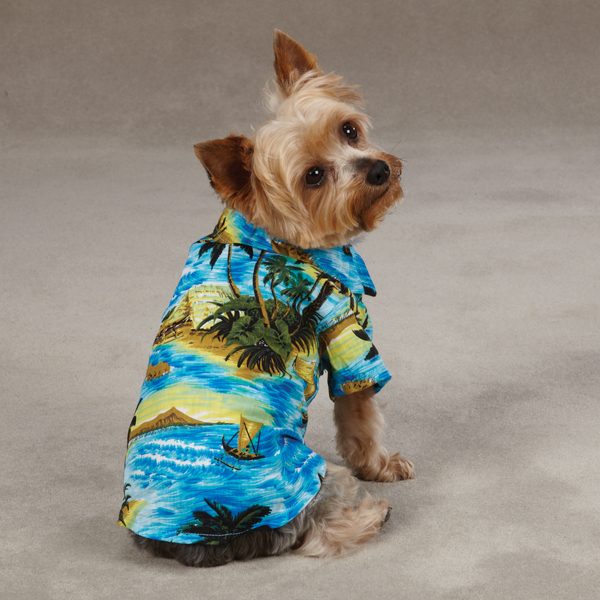 Choosing the best shirts for our furry friends is not as easy as it may seem at first sight. Because we’ve got your animal’s best interest in mind, we’ve put together a list of the most important things you should be looking for before actually purchasing a cool shirt for your pet. As if choosing between the thousands of models out there wasn’t complicated enough, another factor that should weigh in your decision is your dog’s breed. As you probably know, every furry animal has its own protective shield, in the form of thermo-insulated sebum. Because dogs weren’t always domestic animals, and their ancestors, the wolves, used to be deprived of any kind of comfort, these animals developed their own natural protective mechanisms, and the sebum secreted by their skin is one of these evolutionary adjustments. However, because now we mostly keep our dogs indoors, their mechanisms aren’t as powerful as they once were, not to mention the dog breeds humans obtained through inbreeding for the sole purpose of keeping people company (such as the French Bulldog). Depending on the type of breed your dog is, its needs may be particularly different from other breeds out there. Cold isn’t the only reason why dog owners decide to buy shirts for their pets. Because some dog breeds originate from cold places (such as the Husky), some dogs need an extra layer of thermal insulating clothes during the summer, as well. Although most of the dog breeds should be kept in climate conditions similar to the ones from the places they originate from, experts have only recently taken this into account in a more serious manner. If you are the owner of a dog that originates from a completely different climate area, the first aspect to consider before buying a cool shirt is your animal’s needs, depending on the season. Additionally, among the dogs that most need shirts, especially during the cold season, the following are on the top of the list: dogs with thin body types such as the greyhounds, older pets regardless of their breeds and smaller breeds, regardless of their age. Once you’ve established your pet’s needs in terms of general climate conditions, you should take the following step and focus on the kind of material. Generally, dogs with very long and thick fur rarely need something to protect them from the cold (and certainly not wool! ), while smaller dogs with slim and tiny fur yarns would rather need a thicker fabric. The first kind of dogs, however, would rather need a very thin shirt that could offer them the thermal protection they need, without adding an extra layer of fur. 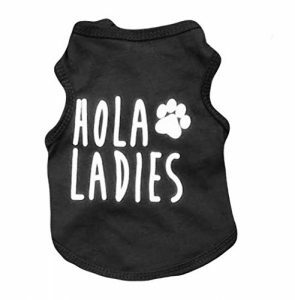 Additionally, these kinds of dogs may need a similar kind of shirt during the hot days of summer as well, especially since they are more sensitive to elevated temperatures. If you’ve decided that wool is the way to go, maybe you should take a second and consider the kind of texture you are going after. 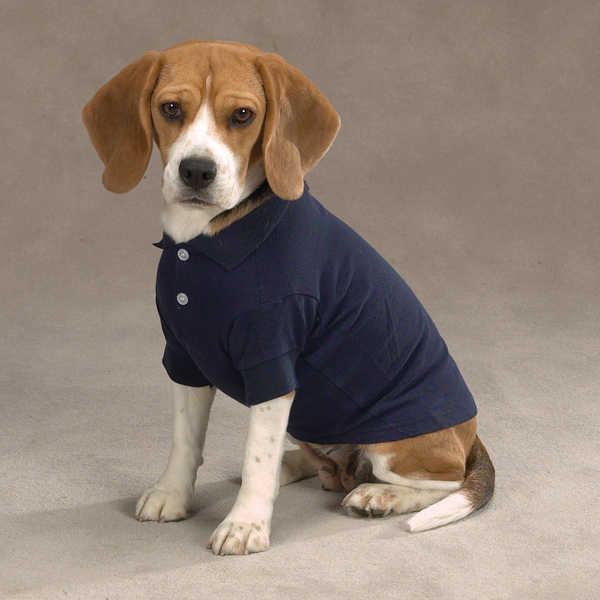 If your dog has a very sensitive skin, an abrasive texture from a wool shirt could cause irritation or a dermal issue. On the contrary, if your dog breed has a strong skin, it can put on a shirt with a more abrasive texture, which will stimulate its circulation, like a soft massage. If you live in a region with intense winds, the generic shirt should have an outer layer that is both waterproof and windproof, doubled by an inner layer that is either lambskin or fleece (the lambskin-fleece combination can protect your animal during the very cold days, as well). If the shirt is merely a raincoat, the season is the one weighing in the decision: a raincoat for the spring and early autumn can be only waterproof, while rain combined with low temperatures calls for the first type of shirt. No two dogs are the same. Besides the fact that within the same breed a difference up to 22 lbs (10 kg) is considered normal, other weight differences generally appear between adolescent and adult dogs, females and males and adult and old dogs. Due to these differences, it is important to make sure that when you purchase a shirt for your pet, it can fit it without any issues. Some of the most important areas where measurements should be taken, at least approximately, are the animal’s back (the top line), neck and chest (girth). When measuring your dog, you should make sure you take a margin of error of 5 percent of the animal’s total weight (or measurement). This is vital when buying shirts for another season, as animals have their natural cycles and either lose or put on some weight depending on the season.